MZone's Know Your Foe. Ace's FFFF. Art from Midnight Maize. UMGoBlog pre-game's with Pat. Game previews from BWS, Touch the Banner. A poem from Big House Blog. Anyone who thinks this game couldn't go either way should just leave this blog right now. As we've seen in this series dating back to the days of Woody and Bo, records go right out the window when Michigan and Ohio State meet. Is OSU down right now? Yes. Are they extremely vulnerable on both sides of the ball? Yes. Does that make me any more confident about tomorrow? Not at all. Ohio State is still Ohio State, and tomorrow it'll have been 2,926 days since we've beat them on the football field. So with that said, let's dive in. Michigan has some areas of concern against this decent Ohio State defense. We dove into the stats a couple days ago, and showed that Ohio State has a pretty good advantage over us in the passing game. Denard's strong suit is running with the ball, that's no secret. But Ohio State does boast a good pass defense, and that will cause problems for us. We had moderate success throwing the ball against Nebraska due in large part to a very well executed game plan by Al Borges. He didn't ask Denard to do anything that he couldn't do. And I think that's going to be the game plan again tomorrow. We have the receiver talent to keep the Buckeye DB's busy. I fully expect Junior Hemingway to play his best game tomorrow...his last game in the Big House. Along the line, we played very well last week, and hopefully that carries over to tomorrow. Fitz Toussaint had a great game against a good Nebraska run defense, and is probably enjoying the best stretch of games any Michigan running back has had since Mike Hart. Fitz is undoubtedly the focal point of our ground game, and that takes a huge load off of Denard. A healthy Denard is one thing to have to worry about if you're Ohio State. But a potent ground game along with a healthy Denard is entirely another. I believe that's what led to such a great performance last week. We have a few offensive seniors playing their last game in Michigan Stadium tomorrow. Center David Molk, RT Mark Huyge, TE's Kevin Koger and Steve Watson, WR's Martavious "Dooms" Odoms, Kelvin Grady, Junior Hemingway and RB Michael Shaw. I expect all these guys to see the field tomorrow in an emotion packed game. No group of seniors have ever gone through what these offensive guys have in their time at Michigan, especially the 5th year guys who were recruited by Carr, and didn't take the bait to transfer or leave. And I'll admit it, I have a man-crush on David Molk. 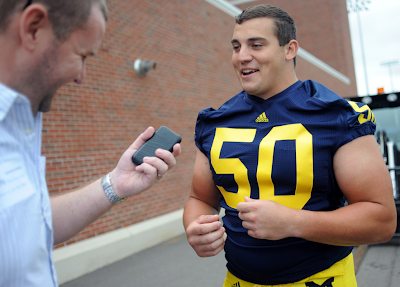 Probably my favorite Michigan OL since Jon Jansen. The pic above is when I interviewed David during media day in 2010. This picture was taken when he was telling me how the only thing he missed when he sat out most of 2009 was being able to hit people "really f_cking hard". For Ohio State to win tomorrow, they're going to need to stop guys like Molk from tearing giant holes in the middle of the DL. Good luck, man. As far as the defense is concerned. I have no worries. I really don't. Ohio State's offense is in shambles right now, and that's not me being arrogant, that's just reality. Braxton Miller can do some things well, but he's just not there yet. For every correct decision or well-executed play, there's two more plays were he makes a terrible throw or scrambled directly into a defensive lineman. Posey is a dangerous WR, but only in the hands of a competent quarterback and a coordinator who can get him the ball 5-8 times a game. Dan Herron is a good runner, but again, it's going take more than just a single guy to compete with the swarm of blitzes and DL rushes that Mattison is likely unleash tomorrow. And that brings me to another point. Expect to see things, on both sides of the ball, that no one has seen yet this year. You just know that Borges and Mattison have been working every day since they got here on surprise looks and schemes just for this game. I can honestly say that my pick for player of the game will be Mike Martin. No one on the field is as good at what they do as he is. He will literally eat the interior of Ohio's offensive line for lunch tomorrow. He is a beast. And has been getting beastier in the last few weeks. Overall, I expect OSU to try and play as loose as possible offensively tomorrow in hopes of trying to out-finesse us. But as anyone who follows this series knows that playing loose will only hurt you in this game. This game is all about discipline, toughness and establishing dominance along the line of scrimmage. On both sides of the ball, especially on defense, Michigan has the clear advantage. The team with the most rushing yards will win the game...mark my words. Prediction? Well, you all know I never give a score perdition, but if we can play to our strengths tomorrow like we did against Nebraska, and force Ohio State to make mistakes and turn the ball over...and if the crowd can really bring it, we'll win going away. But I am not over-confident at all about this game. Because I know that momentum can be a funny thing, and anything can happen in this game. But what we have going for us right now is a healthy Denard Robinson, a punishing rushing attack, a great defense, a clear advantage in coaching on both sides of the ball, the momentum of a two game winning streak, Ohio State dealing with two game losing streak, and home field advantage. All of those things combined should equal a win. But again, anything can happen. • The Game Wallpaper "Inked"
Michigan will win going away? Surely you jest! The Maize and Blue haven't won since Denard was in grade school. The only decent defense Michigan has faced this year is MSU and how did that turn out? OSU's defense will keep it close and Braxton Miller will make a play to win a tight game. No "W" but hey at least you will still have your man crush.